12/4/2007Share this story on Facebook! It isn't often Ithaca has princesses visit, but on December 12 the "Princess of Black Poetry" will give a free public presentation. Nikki Giovanni, world-renowned writer, commentator, activist and educator, is giving a public presentation as part of the “In My Own Words” series sponsored by the Office of Multicultural Affairs. Giovanni has spent four decades writing, and they haven't gone unnoticed. She published her first volume of poetry, “Black Feeling, Black Talk,” in 1968, which dubbed her princess title. She has published 30 books for both adults and children, many of them winning prestigious awards. Her autobiography, Gemini, was a finalist for the National Book Award; her children's picture book Rosa, about Rosa Parks became a Caldecott Honors Book; and Love Poems, Blues: For All the Changes and Quilting the Black-Eyed Pea were all honored with NAACP Image Awards. But it's not just her writing that makes her a princess. Her outspoken truth have also achieved widespread recognition and honors. Her recorded reading of poetry over a gospel music soundtrack, “Truth Is On Its Way,” received the Best Spoken Word Album award from the National Association of Radio and Television Announcers. 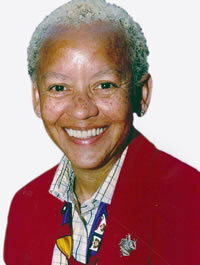 The “Nikki Giovanni Poetry Collection,” on which she reads and talks about her poetry, was nominated for a 2004 Grammy Award. But let's face it: you're never a true princess until Oprah's involved. Recognized by Oprah Winfrey as one of 25 "living legends," Giovanni is currently works at Virginia Tech as a University Distinguished Professor of English. She has also been named woman of the year by the magazines Mademoiselle, Ladies Home Journal and Ebony; selected for the Ohio Women’s Hall of Fame; presented with the first Rosa L. Parks Woman of Courage Award from the Southern Poverty Law Center; and awarded the Langston Hughes Medal for poetry. Ithaca College is proud to present this royal presentation to the campus and community, for it is an honor to be in the presence of such accomplishment.